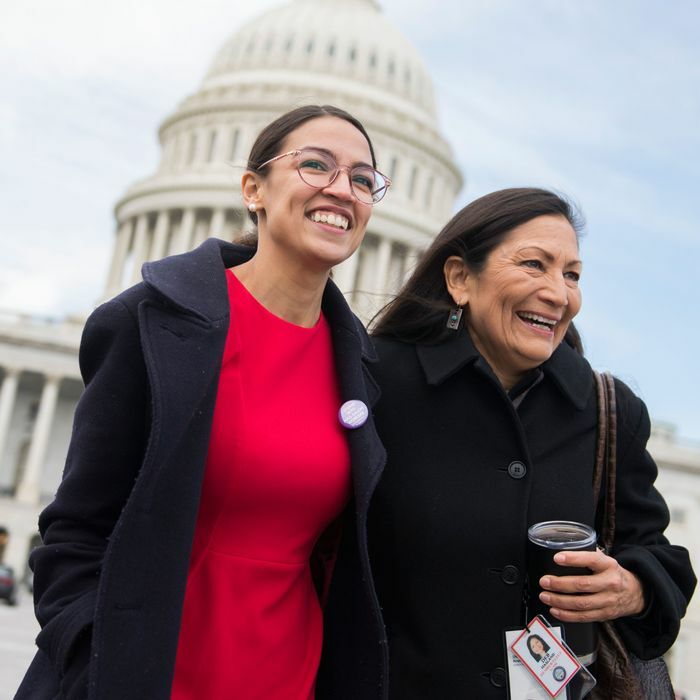 Progressive Representatives-elect Alexandria Ocasio-Cortez and Deb Haaland. Photo: Tom Williams/CQ-Roll Call,Inc. In midterm election years, November and December are marked by more than holiday observances and high-carb food. It’s a time when political analysts take a long look back and a longer look forward at what the midterm results mean for the two political parties, led often by ideological factions determined to prove their way is the highway to success in the next contest. This is an especially urgent task for moderates of the center-left and center-right, who often take credit for wins in hostile territory and warn that they alone can win the big presidential prize just down the road — or at least that used to be the case. Nowadays, moderate Republicans are an endangered species, and at the presidential level, being at least “moderately conservative” or having some distinctively savage brand of right-wing politics like Donald Trump has become mandatory. The ideological “struggle for the soul of the party” is more common among Democrats, who haven’t had a loud-and-proud lefty president since FDR. [The results] had very little to do with the characteristics of the local House candidates. In making their choices, voters apparently were far more concerned about which party would control the House than about who would represent their district. As a result, the advantage of incumbency reached its lowest level in decades — less than three points in terms of margin, according to an analysis by Gary Jacobson. [F]or both Republican and Democratic incumbents, election outcomes were overwhelmingly explained by the presidential vote in the district. Moreover, the incumbent’s voting record had little or no influence on the results. For Republican incumbents, conservatism had a very small and statistically insignificant negative impact on incumbent vote share. For Democratic incumbents, liberalism had a very small and statistically insignificant positive impact on incumbent vote share. These findings have limited implications for Republicans, who, barring something unforeseen, are stuck with Trump in 2020. And however you choose to define Trump’s ideology, he has shown little to no interest in appealing to Democrats and Democratic-leaning independents (other than those who already share his white nationalist tendencies). For Democrats, though, the idea that running “to the center” generates no measurable electoral gains will be a central talking point for those who want to run hard to the port side of the ship. Indeed, for many self-conscious progressives these days, there are only two plausible reasons for a Democrat being anything other than a progressive: pure political expediency, or corrupt submission to corporate power. Only the former justifies the presumed sin of centrism. This is a pretty important issue in intra-Democratic debates. While progressives may excuse, say, a Democrat’s refusal to fully embrace an immediate leap to single-payer health care in conservative areas of the country, they tend to assume such a centrist posture must be accompanied by public or private acknowledgement that of course Medicare for All is the ultimate goal. It is far less acceptable to claim that some other form of expanded health coverage — say, Obamacare with a strong public option — is actually a superior policy. That sort of talk must reflect a sellout to private insurance interests, or so it seems to those who assume that Democrats should press for as much democratic socialism (to choose the most prevalent label) as political markets will bear. There are going to be other leftward pressures on Democrats going into 2020. As Jamelle Bouie argues, white Democratic presidential candidates seeking to display solidarity with an increasingly nonwhite primary electorate may seek to do so with more controversially progressive positions. But in the general election, if it just doesn’t matter what flavor of Democratic policy thinking you use to spice up your messaging, since everyone is polarized for or against Trump as a matter of first principle, then left activists are going to want to know why any Democratic candidate doesn’t steer steadily to the left. Would-be moderates need a better answer than “I have a poll!” Because this time around, they probably don’t.